That's for the CVT/automatic, and it makes it the best fuel economy for any non-hybrid. "... will rank as one of Canada's most ... fuel efficient new cars"
"... expects the new car's fuel economy to be among the best for gasoline-powered cars in Canada." According to the Australian mileage testing, only the Smart ForTwo (with start/stop) and Prius C (a hybrid) beat the Mirage out in fuel economy. That is a heck of a good start. Sadly, the Australians don't get the Scion/Toyota iQ which currently holds the Canadian and U.S. title for having the best combined fuel economy rating for a non-hybrid (EPA: 37 mpg US combined). So we don't know yet for sure if Mirage will wear the MPG crown in the North America. But we're going to keep digging. Last edited by Daox; 01-17-2013 at 01:26 PM. The closest comparison we really have in Australia is the Chevy (Holden Barina) Spark. To get some ballpark we can compare the ratings of the Australian Mirage and Spark to the Canadian and US Spark ratings and take a good stab at the what the Mirage's fuel economy might be. To simplify things we'll just take the highest ratings. 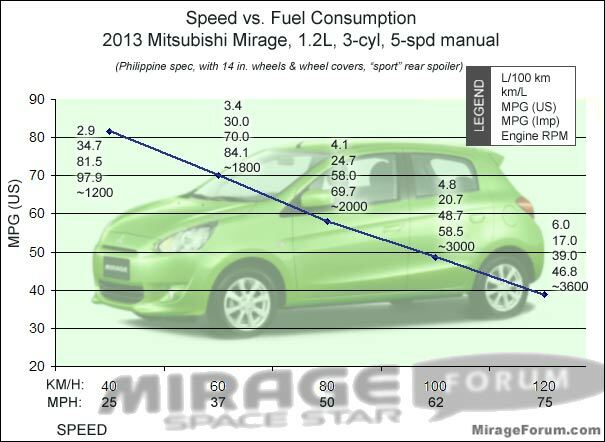 This shows that the Mirage is rated as having 13% better fuel economy than the Spark. So, if this holds true (and remember, this is a best guess), the Mitsubishi Mirage could dethrone the Scion iQ for highest mileage car that is a non-hybrid! The Canadian iQ is rated at 6.5 L/100km city, 4.7 L/100km highway. In the US, the iQ is rated at 37 mpg combined, so 38 mpg would beat it. For kicks, I looked up the Mirage's Japanese rating and it gets between 23.2 km/l / 55 mpg / 4.3 l/100km and 27.2 km/l / 64 mpg / 3.7 l/100km. The reason I looked up the Japanese ratings is that Japan also has the Toyota/Scion iQ. It is rated at 20.8 km/l / 49 mpg / 4.8 l/100km in one trim, and 21.2 / 50 mpg / 4.7 l/100km in another. Sorry, I can't read Japanese, so I don't know the difference. Anyway, the important thing here is that the Mirage quite easily beats the iQ in the mileage department, and in some trims by quite a bit! Last edited by Daox; 01-12-2013 at 08:03 PM. Where did you source the Oz fuel economy figures? Jamie thought they're not published yet. We have the combined fuel rating published just not the urban and extra urban cycles yet in Australia. Correct. The Mitsu AU site has 4.6 l/100km quoted as well as 4.8 l/100km and 4.9 l/100km. I assume the 4.6 is probably for the manual and the 4.9 is for the CVT. I'm not sure what the 4.8 is. Here's another comparison for the pile that suggests the Mirage will go straight to the head of the MPG class in Canada/US (for a non-hybrid). It's going to be very interesting to see how this all plays out. wow. that UK mirage really gets the mileage. i wonder if they had to revise that number down or if it's because of the different gear ratio for 5th gear? The Euro/Japan Mirage is a bit more efficient than the rest of the world (slightly higher compression, stop/start in most models, slightly better aero, slightly taller manual gearing), but the biggest difference by far is the NEDC testing method. It doesn't directly compare with the EPA/NRCAN tests -- NEDC produces unrealistically high numbers (even higher than the old NRCAN ones, but not as silly as the Japanese tests). They're currently taking a lot of flack on this topic from annoyed media & motorists.